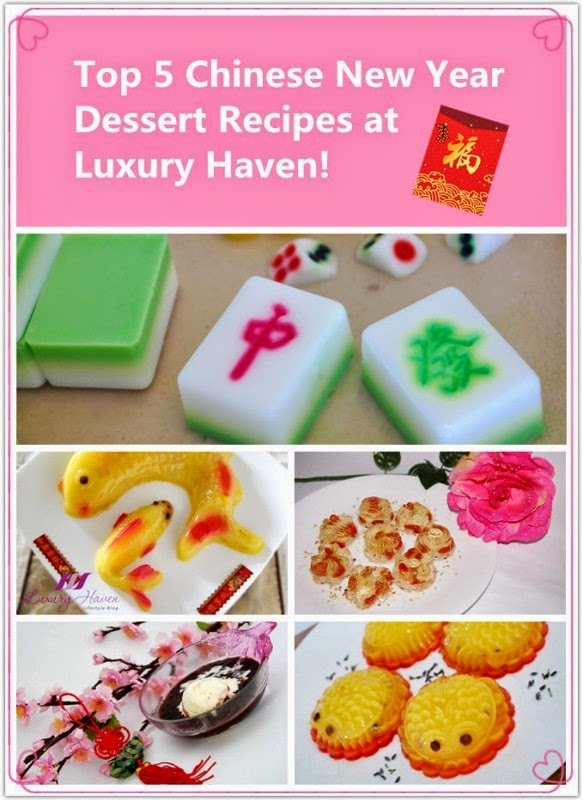 You are here:Home » Recipes » Top 5 Chinese New Year Dessert Recipes at Luxury Haven! Spotted at OMY-食天堂Eat and featured at PtitChef! 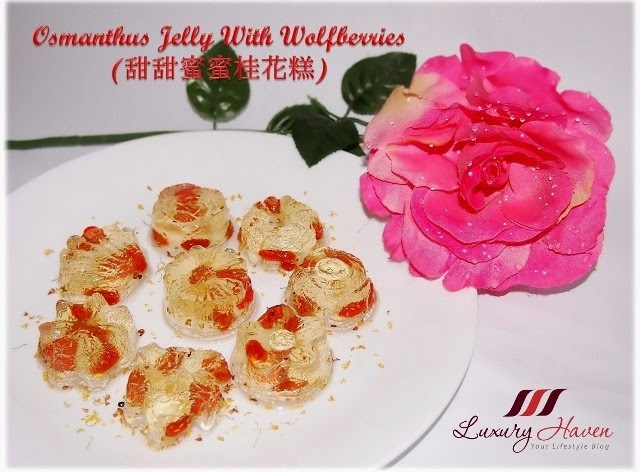 The combination of the two wonder Chinese herbs makes this Osmanthus Jelly With Wolfberries ( 甜甜蜜蜜桂花糕 ) a delightful healthy dessert. Taking this traditional hot dessert to another level, simply by having it chilled with a scoop of Vanilla Ice-cream! Lovely Scented Mango Pudding with Dried Lavender Flowers! Gosh, these Mango Pudding Desserts taste sooooooo good with the Lavender Dried Flowers!! These fishes are too pretty!! Mahjong Agar Agar Cake, Anyone Game? 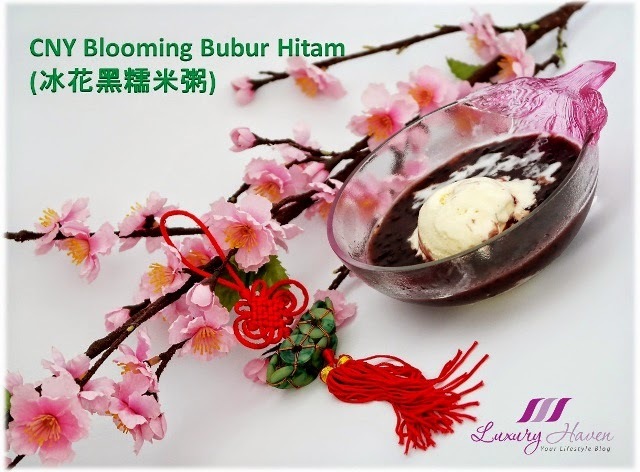 This is a perfect time to make this dessert especially for mahjong kakis, don't you think so? Have you tried any of these recipes? Here's wishing all a Happy and Prosperous Chinese New Year! Huat ah! A Happy & Prosperous CNY to you too! Your dishes take my breath away. What a fabulous presentation!! 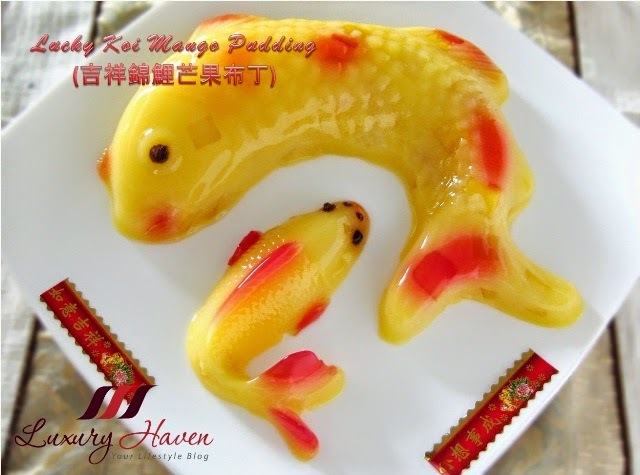 Happy Chinese New Year wow these will be hard to eat is so beautiful and so artistic. you're an artist my dear! I absolutely love all of these desserts...someday I must try recreating one of your dishes. Those gold fish look amazing! Mango pudding...maybe that one wouldn't be too hard to do? It looks delicious! These are all works of art!!! And they ALL look amazing! These looks really yummy! Happy New Year! These pretty treats almost look too good to eat Shirley! Happy New Year to you and your family! Those jellies looks cute, but I've never grown to appreciate the texture. Happy CNY! I remember some of these desserts, Shirley. I just forgot how absolutely gorgeous they are. Another fantastic presentation. Thank you! Shirley, Gong Xi Fa Cai! All your desserts are simply awesome. I'll have to say my favorite is the Mahjong Agar-Agar Cake. Reminds me of my grandpa because CNY is the only time grandma would allow him to play mahjong! That's so cute, PH! Me too, I only play once a year. Hahaha! Gorgeous, colourful, vibrant and feel like continuously staring all those desserts. Amazing desserts, Shirlye. I hadn't hear about them. Thanks for sharing. Have a wonderful week! Gong Xi Fa Cai, Shirley! I like your majong agar agar the most. They are so cute!!! Huat ah! I love these desserts, they all look almost too pretty to eat! I love all your goodies. Look beautiful and delicious! Happy CNY, Shirley! It is not too late to greet you. I love Mahjong Cake. It's so funny. Very beautiful indeed. I remember I had Mahjong pineapple cake before which is from Maxim Hong Kong. Blessed CNY to you and family, Shirley.